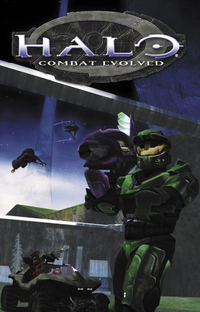 The Halo: Combat Evolved Manual. 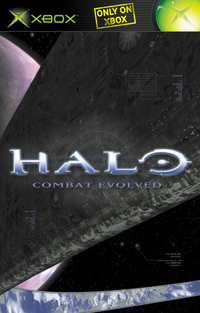 The Halo Combat Evolved Instruction Manual is a guide to Halo Combat Evolved that comes in the basic package. A slightly updated version came with the PC port of the game holding new info on the multiplayer exclusive weapons and vehicles, and relevant changes regarding it being on PC. This section went over the important safety information about playing video games. This section holds info on using the Xbox video game system. And how to avoid damaging your disks. This section holds info on using the Xbox Controller. This section holds what has happened previously in the Halo Universe. The year is 2552. Planet Earth still exists, but overpopulation has forced many of her former residents to colonize other worlds. Faster-than-light travel is now a reality, and Earth’s unified government, through the United Nations Space Command, has put its full weight behind the colonization effort—millions of humans now live on habitable planets in other solar systems. A keystone of humanity’s colonization efforts is the planet Reach, an interstellar naval yard that builds colony ships for civilians and warships for the UNSC’s armed forces. Conveniently close to Earth, Reach is also a hub of scientific and military activity. This was humankind’s first encounter with a group of aliens they eventually came to know as the Covenant, a collective of alien races united in their fanatical religious devotion. Covenant religious elders declared humanity an affront to the gods, and the Covenant warrior caste waged a holy war upon humanity with gruesome diligence. After a series of crushing defeats and obliterated colonies, UNSC Admiral Preston Cole established the Cole Protocol: no vessel may inadvertently lead the Covenant to Earth. When forced to withdraw, ships must avoid Earth-bound vectors—even if that means jumping without proper navigational calculations. Vessels in danger of capture must self-destruct. Existing SPARTAN-II soldiers are recalled to Reach for further augmentation. The plan: board a Covenant vessel with the improved SPARTAN-IIs and learn the location of the Covenant home world. Two days before the mission begins, Covenant forces strike Reach and annihilate the colony. The Covenant are now on Earth’s doorstep. One ship, the Pillar of Autumn, escapes with the last SPARTAN-II and makes a blind jump into deep space, hoping to lead the Covenant away from Earth. This section tells you about the menu. It tells you how about the Campaign, multiplayer, settings sections of the menu. Interestingly this section of the manual also mentions a section of the menu on Game Demos. Though this feature was not present in the final build of the game. This section goes though how to save and load a game. This section goes though information on the Pillar of Autumn, and the cast of Human and AI companions you come across in this game. The Pillar of Autumn is a Halcyon-class warship that has seen decades of service. An aging but sturdy vessel, and one of the smallest cruisers in the human fleet, the military High Command chose it specifically as an inconspicuous launch pad for a covert offensive against the Covenant. Genetically-engineered cyborg soldiers in state-of-the-art battle suits were supposed to board a Covenant vessel and locate the Covenant home world. A surprise Covenant attack on the human military base on the planet Reach annihilated all but one of the SPARTAN-II soldiers. Known only by his rank of Master Chief, this SPARTAN-II was stored in a cryosleep chamber on the Pillar of Autumn shortly before the ship made a blind jump across the galaxy in a desperate effort to lead the Covenant away from Earth. The Master Chief is easily the best soldier aboard the Pillar of Autumn, but many of the human military’s finest also call the ship home. Twenty-six years into his military career, Captain Keyes commands respect as a keen strategist and inspirational leader of his men. He became a minor hero early in his career, when he led a small group of security troops against a Covenant ambush of the colony ship Meriwether Lewis and held them off long enough for the ship to escape. His many decorations and years of combat experience against the Covenant made him a natural choice to command the Pillar of Autumn and its secret cargo. A rugged and diverse assortment of soldiers, the Marines on the Pillar of Autumn are fighting a losing battle against the Covenant’s superior weaponry and numbers. Under the leadership of Captain Keyes they continue to wage a furious struggle against the Covenant, even as their numbers dwindle. They’re the best of the best—but they’re only human. Cortana is the highly advanced AI at the heart of the Pillar of Autumn. Her design allows her to be uploaded into an appropriately configured battle suit for increased mobility. She is capable of hacking into alien computer systems, and has used this skill to intercept Covenant communications during combat. She interprets this data to provide her caretakers with directional waypoints and the best available information about troop movement and strategy. This section goes over the Covenant enemies you will face during the course of the game. The Covenant forces have spent more than thirty years trying to wipe out humankind. Because their efforts have been so successful, and because few Covenant troops have ever been captured alive, little is definitively known about their origins, society, or motivations. Intercepted communications and battlefield reports indicate a religious underpinning to their genocidal campaign. What follows are brief descriptions of the alien races known to belong to the Covenant collective, gathered mostly from encounters on the battlefield. Approximately 5’ tall and relatively weak, Grunts tend to travel in packs and stick close to more powerful allies. Individually they are easy to defeat, but in groups they can overwhelm careless Marines. Their armor seems to house some sort of lifesupport mechanism. They are known to use a variety of weapons including the plasma pistol, plasma rifle and plasma grenades. With superior senses of sight, hearing and smell, Jackals serve as scouts and assassins for the Covenant forces. They use plasma pistols and carry a strong energy shield to compensate for their physical weakness; a well positioned Jackal can hold his own against several Marines, though grenades are effective against them. They stand approximately 5’ 8” tall. There are a few varieties of the Elite, but all are roughly 8’ 6” tall and incredibly strong. Their strength allows them to rely on brute force when necessary, but they’re quite capable of brilliant battlefield tactics as well. Their natural resilience is augmented with full-body energy shielding which recharges when depleted. They wield plasma pistols, plasma rifles, grenades and needlers. Hunters stand 12’ tall, though in their combat state they contract to approximately eight feet. Hunters fight with a Fuel Rod Gun integrated directly into their armor. They carry an enormous and nearly-impervious metal shield made of an unknown alloy, which they sometimes use as a melee weapon. This section goes over the Master Chief, the character you play as. And important info how stuff works. You are the Master Chief—all that remains of a classified military project to build a series of genetically enhanced super-soldiers. You are humanity’s last and best hope against the Covenant—but you’re woefully outmatched, and survival is not guaranteed. Human soldiers have used performance-enhancing equipment for hundreds of years, and your MJOLNIR battle suit represents the current pinnacle of military technology. As a product of the SPARTAN-II project where you were bio-engineered and technologically enhanced for better reflexes, eyesight, and coordination, the addition of your MJOLNIR armor makes you nearly invincible. The battle suit utilizes a neural interface implanted in your brain. Your armor’s movements and weapons are controlled at the speed of your thoughts. The battle suit also contains a layer of crystal that forms a network capable of supporting starship-grade AI so you can overpower alien computer systems if necessary. The suit’s shell is comprised of many layers of strong alloy and a refractive coating to disperse energy weapon hits. Internally, the suit regulates temperature and can reactively change in density as necessary. This section goes over how to use the melee. This section goes over how several human weapons work. The M9 high explosive, dual purpose grenade is a thrown fragmentation device. Use it to suppress or disable vehicles, except tanks. It can be thrown, rolled, bounced or ricocheted into places direct fire weapons can’t reach. Increase the angle of the throw to toss it farther or get it over obstacles. Be careful not to throw it too close to your own location. This pistol is a recoil-operated, magazinefed handgun. It is issued with a smart-linked scope capable of 2x magnification. It fires 12.7mm semi-armor-piercing, high-explosive rounds. It can shoot either semiautomatic or automatic fire. This rifle is gas-operated and magazinefed. It fires 7.62mm armor-piercing rounds. Rate of fire is limited by a soldier’s ability to aim, fire and change magazines. Short, controlled bursts are more accurate than fully automatic fire. The MA5B’s integrated computer displays rounds left in the magazine and the relative direction of the gas giant, Threshold, for point of reference. This feature is particularly useful for orienting you in areas where it’s easy to get turned around and lose your sense of direction. The shotgun is a pump-action magazinefed (dual tubular non-detachable type) weapon. It fires 8 gauge magnum (3.5”) rounds. This weapon is very effective against targets at close range and may be used to engage several targets simultaneously at medium and long range. This rifle is a gas-operated magazine-fed weapon. It is issued with a smart-linked scope with two levels of magnification (2x, 8x). It fires 14.5mm armor-piercing fin-stabilized discarding-sabot rounds. WARNING: The 14.5x114mm APFSDS round is an anti-materiel munition. It can easily over-penetrate several armored soldiers. Be sure of what is on the other side of your target before firing. The M19 SSM is a man-portable and shoulder-fired rocket launcher. It has two major components, the launcher and the magazine. The magazine (the expendable part of the system) contains two 102mm shaped-charge, high-explosive rockets. It is designed for fast, easy detachment from the launcher. The launcher contains the sighting and fire control systems. It is issued with a smart-linked scope with two levels of magnification (2x, 8x). The Warthog’s M41 light anti-aircraft gun is a three-barreled, electric-powered, linkless, drum-fed weapon. It fires 450 to 550 12.7x99mm armor penetrating rounds per minute. Turret traverse rate is 100 degrees per second and weapon elevation rate is 60 degrees per second. Recoil from sustained fire is prodigious and negatively impacts accuracy at long range. This section goes over Covenant weapons. This is a directed energy weapon. It is capable of either semiautomatic or automatic fire. Continuous rapid fire overheats the weapon—this in turn depletes the weapon’s power core. We currently do not understand how to replace or re-charge a power core. Note This weapon will deplete its energy source as you use it. It is wise to replace it as often as possible. This weapon is a semi-automatic directed energy weapon. If you pull and hold the fire button, the weapon may become over-charged; when the fire button is released the bolt is launched. After the over-charged bolt is launched the weapon temporarily stops functioning as it dumps waste heat. Use of the over-charge capability rapidly depletes the weapon’s power core. We currently do not understand how to replace or recharge a power core. Very little is known about this weapon other than that it is a magazine-fed weapon capable of automatic fire. Its projectiles penetrate soft targets no matter what the angle of impact. They ricochet off hard surfaces at oblique angles, however, and are always deflected by energy fields—the only exceptions to this are the shields generated by the MJOLNIR battle suit and the Elite’s combat armor. The composition and energy signature of its projectile is unknown. The manner in which the projectiles home in on their target is also unknown. This section goes over vehicles in the game. This area goes over the human vehicles in the game. The Scorpion Main Battle Tank is primarily an anti-vehicle weapons platform, but it also has very high anti-infantry capabilities. Its ceramic-titanium armor makes it nearly invulnerable to small arms fire, but its deep dead-zone (the area within which fire from the tank’s guns cannot hit targets) puts it at risk from enemy anti-tank infantry. Up to four soldiers may ride on (and fire from) the Scorpion’s track pods. Riding on a tank is always hazardous and should be done only when the advantages outweigh the risks. The M12 light reconnaissance vehicle (LRV), or Warthog, is the standard vehicle of the UNSC armed forces. It is fast and maneuverable, but prone to rollovers during hard cornering. A three-barreled machine-gun is mounted in the rear of the vehicle. Armed passengers significantly increase the unit’s anti-infantry capacity. The Ghost is the Covenant’s standard reconnaissance and rapid attack vehicle. It is equipped with two of what are now accepted as the standard light vehicle mounted weapons: a directed energy weapon capable of projecting a bolt of superheated plasma in the 100–250kW range. While the vehicle is fast and maneuverable, the driver is virtually unprotected. The Banshee is the Covenant’s standard ground assault aircraft. It is very fast, extremely maneuverable and capable of hovering. It has two weapon pods mounted to either side of the fuselage. Both of these pods contain a light plasma cannon and a fuel rod cannon. Though small arms fire may disrupt or disable the pilot, only heavy weapons are capable of inflicting damage or destroying the vehicle. This section explains multiplayer, co-operative play, and split screen. This section explains what Bungie is. This section goes though who made the game. This section goes over what legal stuff you could do when you first purchase the game. This section went over places you could call if your game has problems. Or if you needed help playing the game. Halo PC had numerous changes to the manual. While most of the normal info stayed the same, the following changes were made. A section all about Halo Community's was added. The "Using the Xbox Video Game System" was changed into "Setup and Installation", a section about how to install the game and set it up. The Using the Xbox Controller" section was changed into "Game Controls", a section on how to play the game on PC. The section on Multiplayer was updated to account for the new online aspect of it. The credits added a section for the team who did the PC port. The support section was updated to suit the PC version. Weapon and vehicle sections had additions for the multiplayer. Added info is below. The M7057 Defoliant Projector is a standard chemical flamethrower which projects and ignites a stream of volatile, semi-liquid adhesive. Flamethrowers are cumbersome, difficult to aim, and effective only at a short range. However, they are excellent suppression weapons, and against unshielded enemies or structures they are devastating. The Fuel Rod Gun is an indirect-fire weapon: its explosive projectiles follow an arc-like trajectory. The impact of a Fuel Rod is powerful and effective against vehicles and infantry alike. Be careful, however, as rapid fire overheats the weapon. We currently do not understand how to replace or recharge a power core. The M12A1 light anti-armor vehicle (LAAV) is a variant of the Warthog—the machine gun is replaced with a triple-barreled 102mm rocket launcher. Like its counterpart, it is fast and highly maneuverable. Although the rocket launcher makes it an effective anti-vehicle weapon platform, the time required to reload the weapon after firing all three rockets leave the vehicle and its occupants vulnerable to counter-attacks. Japanese version of the manual.